Usually, when I’m getting my nails done at a nail salon, I noticed women asking for a polish change and an eyebrow wax. I wonder, do they not know that waxing is pulling their skin and it causes wrinkles and sagging eyelids? I guess not, and this is why I want to write this blog and educated all the beautiful ladies why waxing is a BIG NO for your face and threading should be you’re best friend when it comes to hair removal. Don’t get me wrong waxing is great for your body, where hair can be removed quickly, however its not good for your face. The skin on your face is much more delicate and is more exposed to the sun than the rest of your body. Overall your skin on your face is much more sensitive than your body is. Waxing on the face irritates the skin and pulls, where winkles and eye lid sagging start to show as you age, quicker than the women who threaded their eyebrows or face. 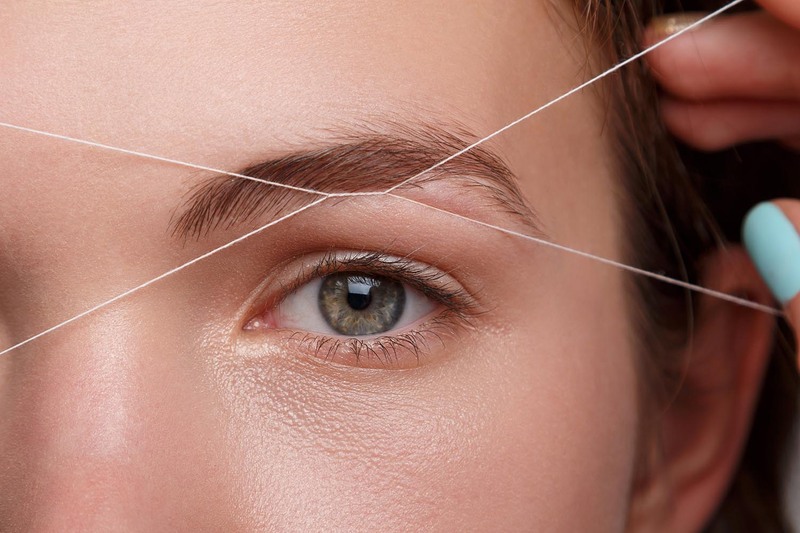 Threading is a technique that uses 100 % cotton thread to remove unwanted facial hair. So basically no chemicals used and only pulls the hair and not the skin. Also the repetition of threading is great for your skin because is it like a mini massage and that’s great for your skin’s blood flow. What I really love about threading is that the thread specialist has more control with the thread, shapes the brows evenly and you can get that perfect Kardashian arch. It is also super quick and you don’t leave having a red face for hours or a sticky face. The great thing about threading is that anyone can have his or her face threaded. What I mean by anyone is that anyone even those who have extremely sensitive skin, are on Accutane, has done some sort of laser or even pregnant. This hair removal technique is as natural as it gets. This is why threading should be your best friend when it comes to hair removal for your face. Threading only removes the hair however, waxing thins the epidermal layer of the skin. Threading allows pulling the hair gently while waxing opens the pores because of sharp pulling. Threading does not harm the skin but warm wax can increase its sensitivity. Skin will sag over time because of the pulling effect and cell damage wax can cause. Threading will never burn the skin. Dermatologist recommend threading for clients who have sensitive skin or using medication that waxing isn’t recommend for. Waxing does not have the same accuracy for brows where threading gives eyebrows a cleaner, smoother and an overall natural look.